One of the most tricky part of learning any new technology or new tool is to figure out the very first/the most basic connection method or command. When I was learning about electric circuit (a small embedded system) was to figure out how to turn on and off the small LED on the board. Everytime when I was trying to learn new computer language, the first thing I was trying to figure out is how to create a program to print out "Hello World". Then what is the Hello World part of MatLab RTL ? It would be to get Matlab connected to the hardware and read a bunch of data (I/Q data) captured by the hardware. This is done by the simple two steps as below. The first line is to define which hardware it want to connect and what kind of configuration you want to apply to the hardware. This line itself does not do anything to the hardware, it is just definition of the configuration. The real work of communicating and controlling hardware is done by the second line. The step(obj_hardwareHandle) connect to the hardware and let it capture the signal as defined in the first line and read the captured data and store it to a variable called 'raw_data'. This is all you need to know of Matlab RTL. 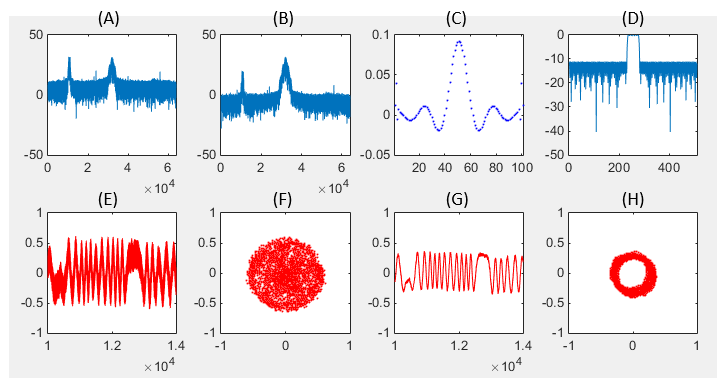 Once you have the data stored in a variable (e.g, raw_data as in this tutorial), all the remaining procedure is up to you and knowledge about generic Matlab function and radio technology. The outcome of the simple tutorial that I will show in this post is as show below. Following is short descriptions on each of the plots shown above. (E) : Real values of raw data (I data) captured by the hardware. (real part of raw_data). 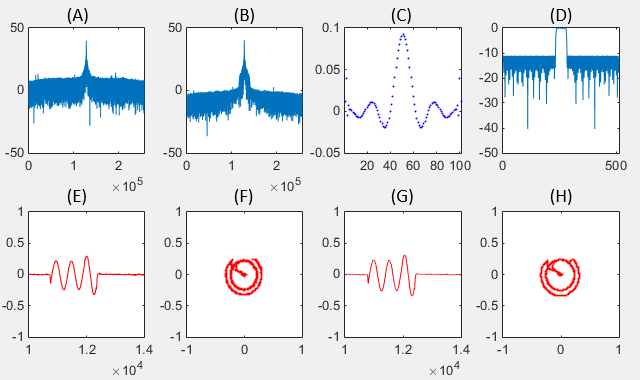 (D) : Frequency domain representation of the digital filter. Following is the matlab source code that I used to get the result shown above. The green part is the critical part for Matlab to capture the data from the hardware and all the remaining part is just generic Matlab fuctions that you might already be familiar with. My next trials was to write a Matlab code to do similar things as SDRsharp. I wanted to set the frequency as shown below (You would need to set other frequencies depending on where you are) and listen the Radio from Matlab. However, it was not as easy as I have thought. I spent a couple of days to figure out proper parameters values and routines that make this possible. The Reference  helped a lot, but I needed to put extra time and effort to find parameters values for this Radio and to create some additional filters for clearer sound. Even with all the efforts, the result was not as good as SDRsharp but at least I could listen and understand the broadcast with a little bit of noise. Following is a snapshot of the real time audio spectrum and you would be able to listen the radio while this spectrum gets updated. Following is my code to listen to the broadcase. % Define Parameters for RTL Device. % hear a kind of knocking sound. If it is too long, you would see too slow update for audio spectrum. % a integer multiples of Decimation Factors. % I set it as 'true' meaning that the Gain is set automatically by the RTL hardware. 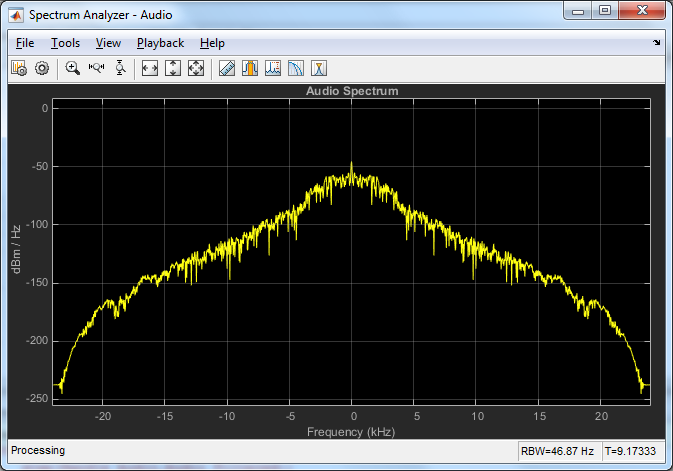 % coming into RTL antenna should be good and should not fluctuating too much. % I tried to filter out the noise at Audio stage only, but the result was not satisfactory. % So I designed a filter to reduce the noise from the raw data. % This is the filter to reduce the noise at Audio stage. % decimate the data by the factor of 50. One of the difficulties I had with playing with RTL device was it is Reciever only hardware.. it does not have any transmitter functionality. The easiest function you can play with would be Radio Broadcast, but the motivation would not last long. Next stage would be to try with signals other than Radio Broadcast like GPS and others, but in those case you may need speciall antenna being installed out side of home or office. I was looking for some other signal that I can play with without any extra investment. Then.. one day my car key caught my attention and I decided to try using my Car key as a signal generator. The result was very satisfactory and this example is about playing with my Car Key. Since I am in North America, the frequency of the RKE is expected to be 315 Mhz, but I wanted to check the exact frequency first. Each of the Key may have a little bit of variations of all. 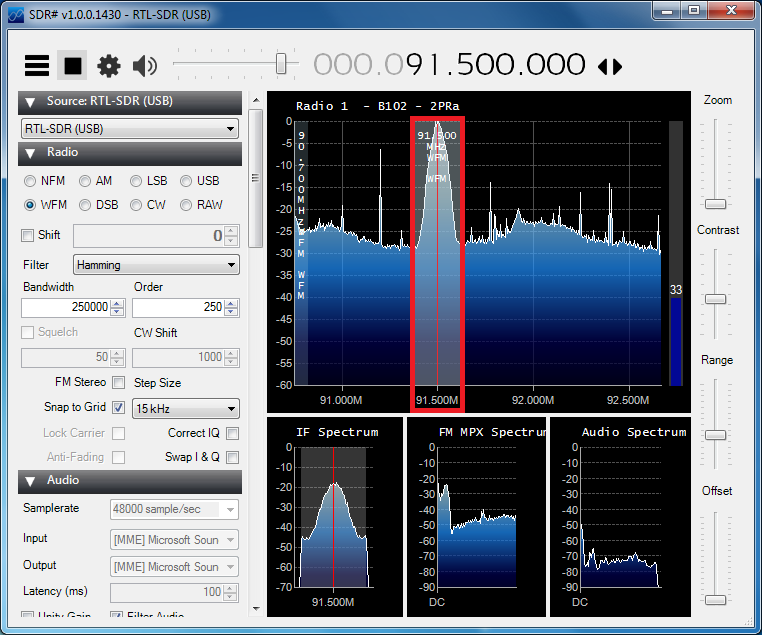 So I confirmed on the frequency with SDRSharp as described in SDRSharp tutorial : Capturing RKE(Remote Key Entry) Signal. Next trial was to use the Matlab code from Example 1 without any modification just to capture the signal and display it. The purpose of this part is just to capture the I/Q Data. So the meaningful part would be (A),(E),(F) in this example. Following is the source code that produced the plot shown above. % not specially optimized for the RKE. 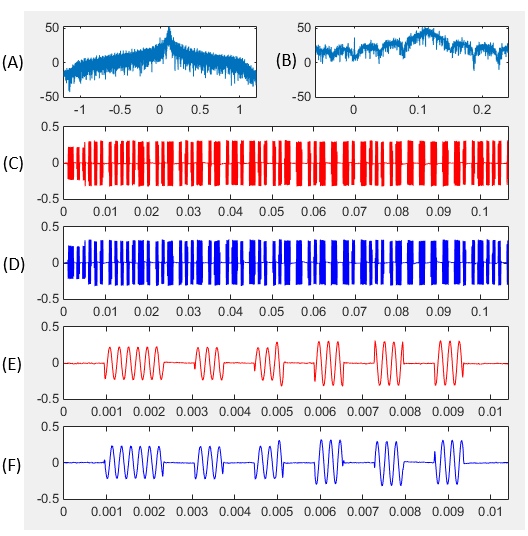 I just used the same parameters that I used for FM demodulation. % You may try with different parameters optimized for RKE if you want. % It would be good for you to understand digital filter parameters. % pretty many samples, it would take too long time to plot if you try to plot it all. % Followings are for producing those plots shown above. % Save the 'raw_data' into a csv file. This saved file will be used for analysis in next step. Next step was to analyze the data captured above in more detail. Followings are the result of the analysis (very simple analysis) for the data saved in the csv file. (B) : The same data as shown in (A) but showing the only portions around the carrier frequency. (C) : Real Part of raw_data (I data of the decimated raw_data). (D) : Imaginary Part of raw_data (Q data of the decimated raw_data). Following is the source code that produced the result as shown above. % other variables like 't' and 'f' that will be created later. % Following is to create tick marks for time domain and frequency domain. % Followings are plotting routine that generates the plots shown above.